*Please note that the links to the content in this Part will direct you to Checkpoint. If you are using Westlaw AU, the links can be found in the Westlaw AU PDF at the bottom of this post. As illustrated by recent successful prosecutions, pursuing money laundering offences in tax cases can be an effective mechanism to penalise individuals involved in serious tax non-compliance. These cases suggest that tax fraud can have the effect of transforming otherwise legitimate business receipts into proceeds of crime such that subsequent transactions in relation to those proceeds may constitute money laundering. This article considers two recent tax scheme cases in the broader context of money laundering and proceeds of crime forfeiture laws in order to examine how the necessary physical elements of the money laundering offence may be shown in a tax case. This analysis suggests that this avenue of prosecution may have significant potential as revenue authorities continue to work closely with law enforcement agencies to combat the most egregious instances of tax evasion. 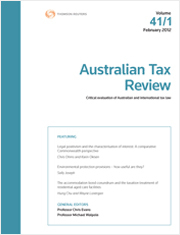 To purchase this article, complete the Individual Article Sale order form and email it to tax.journalsanz@thomsonreuters.com. Recently the Tax and Superannuation Laws Amendment (2016 Measures No 2) Bill 2016 was introduced into Parliament proposing to incorporate a statutory remedial power into Commonwealth revenue legislation. Under the proposal, a statutory remedial power will vest in the Commissioner of Taxation a quasi-legislative power to modify revenue and superannuation laws to remedy “unforeseen or unintended outcomes” where it is beneficial to the taxpayer. The stated goal of enacting such a measure is to provide a timelier resolution of these issues. An effectively drafted and administered measure could provide significant benefits for taxpayers; however, this measure presents challenges to the rule of law and it could be argued takes the form of a Henry VIII Clause. This article will provide the background and context to the proposed statutory remedial power. It will further consider whether a statutory remedial power could be categorised as a Henry VIII Clause and why such clauses are considered undesirable. The article will conclude by postulating if the benefits arising from a properly administered statutory remedial power are sufficient to justify this delegation of power to the Commissioner of Taxation. Section 974-80 is a favourite piñata of tax advisers across the country. In 2015, the Board of Taxation proposed a set of amendments to the debt-equity scheme aggregation and equity override rules which the Federal Government has indicated that it will accept. While the amendments are promising, they are not yet complete. The first part of the test purports to include a consideration of substantive conditions, and the second part of the test purports to require an objective consideration based on clearly identified characteristics. Arguably, neither of these goals have been achieved. This article seeks to undertake a close reading of the Board’s proposed amendments, in order to identify these issues in detail and suggest some potential solutions.